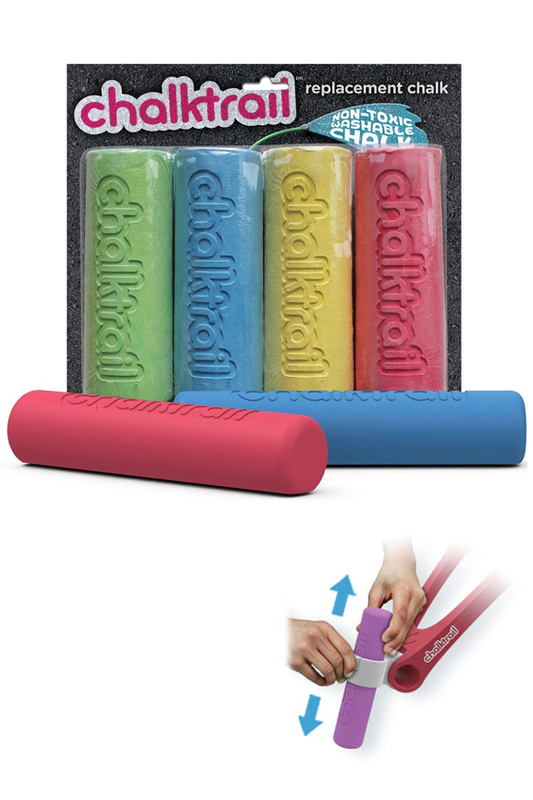 Use this four pack of oversize chalk for regular sidewalk drawings, or use it to reload your bike or scooter Chalktrail holder. Each piece is the perfect size to fit snugly in the device, and each one will offer up to 1.5 miles of colorful fun. When all four pieces are combined, this package provides up to 6 miles of enjoyment for bike or scooter riders. You will get one green, one yellow, one red and one blue, and all of them are totally non-toxic and washable. The high quality pieces will make bold marks on any hard surface, and the vibrant colors will last longer than lower quality alternatives. Encourage endless hours of creative play, and intense physical activity when you keep plenty of chalk on hand for kids to ride and ride without running out. Order a single package at the regular price, or get several to save money. If buying with one of the holders, order from those pages to bundle both products together and pay the lowest price possible. Chalktrail For Bikes sold separately. Uses The prefect size for bike or scooter Chalktrail holders. Color Includes one yellow, one blue, one red and one green. Miles and miles of fun. Get this 4-pack of replacements to keep the colorful lines flowing. Works with scooter or bike Chalktrail devices. Order Yours Today!